Some new StuART for today!!! Just because y’all have made me feel better. Knowing I’m not alone about this darn tree situation helps me tremendously. Thanks for your comments. I read each and every one. That poor tree is sooo big, it’s not even half gone today. And it started on Monday. This entry was posted in The Scottie Chronicles and tagged art, dogs, ecology, friendship, nature, Scotties, trees, watercolors. Bookmark the permalink. 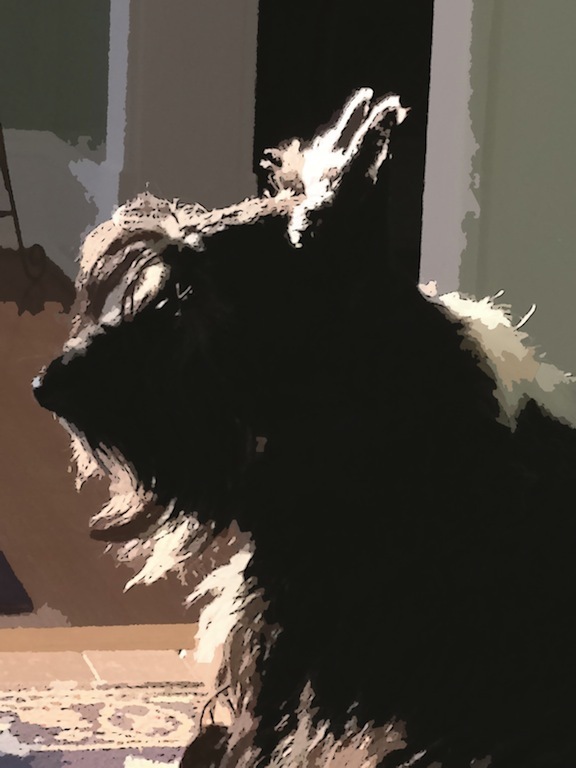 We loves Scotties AND their profiles!! This one is classic, and of course, as we all know, REGAL! We really like this watercolor of you, Stu! We sure love Scotties, and their profiles, but especially this one of you! You are so Regal and handsome! This is a good watercolor of you, Stu! We really like it! Thanks! We may be getting closer to having some to buy…..Weeeee! Stunning profile, Stuart. Alfred Hitchcock would be jealous. Mom had to cut down the cactus because the thorns were hurtful. We never cut down healthy trees. We love the new art. I understand about the cactus. No sweat there. Thanks for liking my art! Please don’t give the tree cutters our address. I would never do that. Ever. How strange, a perfectly good tree. Mum just heard about a lady that gets mad about her neighbor’s tree…she rakes up all the leaves that fall in her yard and dumps them back into his yard. I guess she hasn’t heard about this thing called wind…People are weird sometimes my furiend. Ps – love the profile. Oh my Lord. Are you kidding? It’s one thing to throw somebody’s poop back in their yard because they didn’t pick up, but LEAVES???? Are you sure that neighbor isn’t related to my neighbor?? Huuumm…..